Site was Last modified: January 10 2019. I'll start with Aztec Ruins National Monument in New Mexico. This large complex of an Ancestral Pueblo site has nothing to to with the Aztecs in Mexico, but was misname by the first explorers to see the site who assumed that the ruins were from the Aztecs in Mexico. The Aztec Ruins complex built around 1100 by the Ancestral Pueblo and abandoned around 1300. It is an amazing place. The portion open to visitors, called the West Ruins, once had more than 500 rooms centred on an open plaza. It is about 2 miles long and 1 mile wide. There are four separate archaeological sites to the east that are unexcavated. 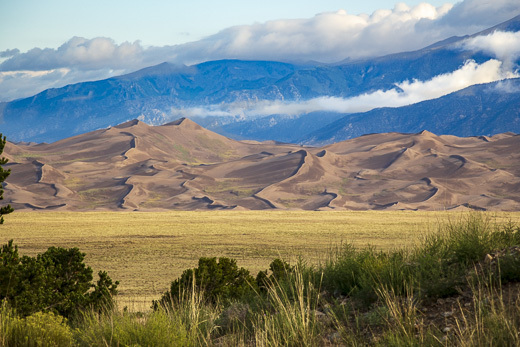 I have always wanted to visit Great Sand Dunes National Park in Colorado, but never had the chance until August 2018 when we took a road trip west. We've visited Jockey's Ridge State Park in NC, the tallest active sand dunes in the Eastern US, and we were expecting something similar in Colorado. We were not expecting the shear size of the sand dunes in the park. Jockey's Ridge covers 426 acres, whereas the Great Sand Dunes cover about 30 square miles and the tallest is about 750 feet high they are big. Travels with Nessie Home :: Site Map:: Contact webmaster@ncsparks.com-email us:: Copyright Leslie Sparks 2006, 2007, 2008, 2009, 2010, 2011, 2012,2013,2019:: Last modified: January 10 2019.